Having just attended TED 2018 in Vancouver, Canada, I am reminded of a former TED talk by musician Amanda Palmer. Her talk, “The Art of Asking,” resonated with me as a reminder that, even in today’s seemingly impersonal digital age, human connection is still a powerful currency. After Amanda Palmer’s talk, the room reverberated with applause, as she received a standing ovation. What she was tapping into, which resonated so powerfully with this audience, was our communal and human need to connect with one another. After all, we are social animals and we naturally strive for a sense of community. As a species, we learn best by social learning as we model the appropriate way to interact with one another. Amanda held the TED audience in the palm of her hand, when she told them that she took her clothes off in front of her fans and trusted them to respectfully touch her. Such is the need for human contact. Babies that are not handled enough in the early stages of their development can fail to thrive. Simply touching the hand of a patient in an Intensive Care Unit (ICU) can lower their blood pressure. Yet in our world of hyper-technology, we communicate in ways that prohibit physical interaction. We talk to one another through email, but we don’t see each other face-to-face, or know how our communication is being received. We have friends on Facebook that we may never meet. This disconnect puts us in a fantastical world, where responses, reactions, and interactions occur in the mind, but not in person. This impersonal, social experience lacks the intimacy and empathy so necessary for human discourse. In allowing people to pay what they want for her music, Palmer has laid the foundation for trust with her audience. This trust leads to face-to-face interactions. It is in those interactions that she works hard to make the most impact. In her TED talk, she emphasizes the importance of simple eye contact. She has also gone so far as to stay with her fans and invite them to be musicians on stage with her while on tour. 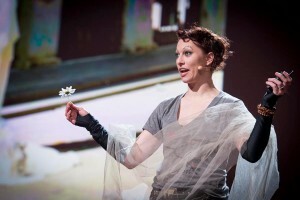 If you haven’t seen Palmer’s TED talk, you can view it online at AmandaPalmer.net. In 13 minutes, it is clear she is passionate about her work and connecting with her audience.